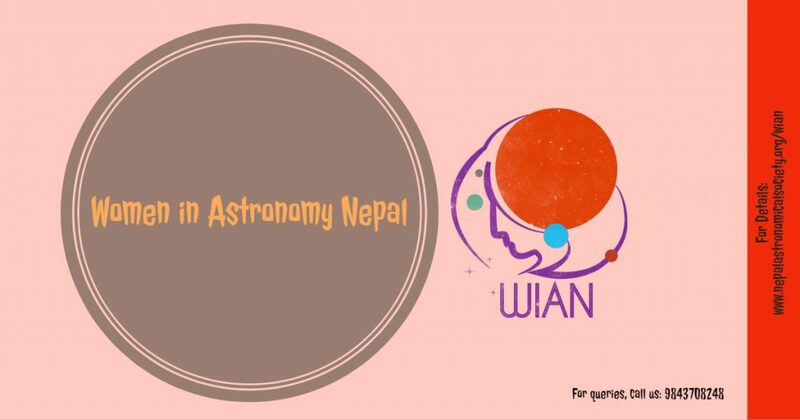 Women in Science Award: This program provides better exposure to the Nepali women student and young professionals working in the field of STEM (Science, Technology, Engineering, and Mathematics). The award has two categories as student category and professional category. Publication: Poster/Flyer/Book highlighting the contribution of women in Nepal and abroad to STEM to their respective society leading their contribution to the global community. January 29, 2019: Application is now open for ‘3rd NASO Women in Science Award 2019’! Click here by February 27, 2019! 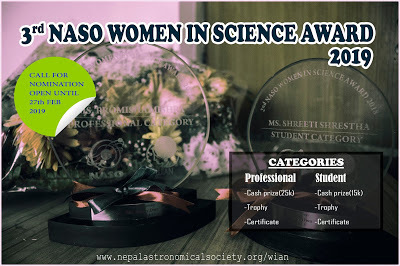 May 30, 2018: 2nd NASO Women in Science 2018 (WiSA2018) winners awarded at a special event ‘Meet and Greet an Astronaut With Dr. Sandra Magnus’ at Nepal Academy of Science and Technology, Khumaltar! May 28, 2018: We are pleased to announce the result of the 2nd NASO Women in Science Award 2018! Read more at http://bit.ly/2JlKQUp. April 10, 2018: Selected applicants are updated about their application status and information on the further process. March 9, 2018: We received a total of 40 applications for WiSA2018! Thank you all for your precious time applying for the award. February 26, 2018: Interested to know more about Women in Science Award (WiSA)? Click here to listen to the interview of Mr. Suresh Bhattarai, Chairman at Nepal Astronomical Society (NASO) by Image FM 103.6 MHz! February 13, 2018: Information regarding the ‘2nd NASO Women in Science Award 2018’ has been communicated to Rashtriya Samachar Samiti (National News Agency)! Click here to read the news published by Reporters Nepal Online. February 11, 2018: Application is now open for ‘2nd NASO Women in Science Award 2018’! Click here to Apply by March 8, 2018! December 4, 2017: UN News interviewed Ms. Manisha Dwa, Coordinator at Women in Astronomy Nepal (WIAN) how she created NASO Women in Science Award to encourage Nepali women and girls in science for their career in Science, Technology, Engineering and Mathematics (STEM)! Click here to hear what she had shared during her interview! April 12, 2017: ‘1st NASO Women in Science Award 2017’ were awarded to Ms. Dibya Ghimire (student category) and Ms. Praynita Karki (professional category) on during a special event organized at Russian Center of Science and Culture in Kathmandu. March 8, 2017: International Women’s Day 2017 poster released now! Click here for the poster!